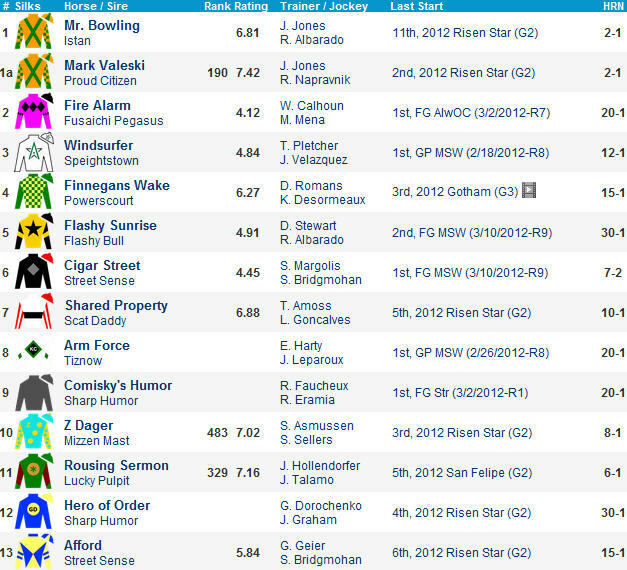 Lecomte Stakes 2012 Preview: Will Hammers Terror scare up a win? 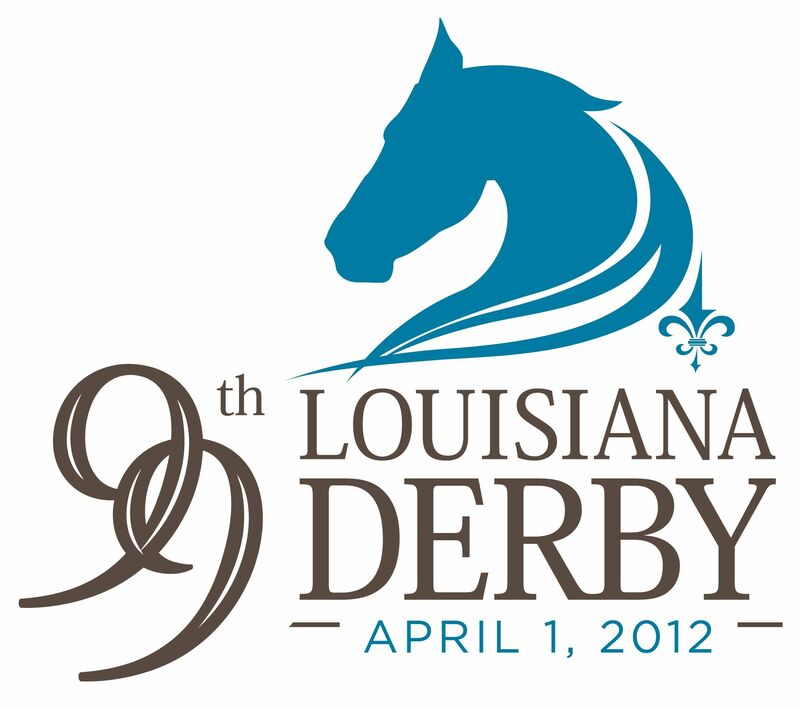 The road to Kentucky Derby 2012 gets underway on Saturday at Fair Grounds with their first graded route for the 3-year-old set, the Grade 3 Lecomte Stakes. The one mile and seventy yard affair has attracted a baker’s dozen and Hammers Terror figures to offer value at 6-1 on the line. 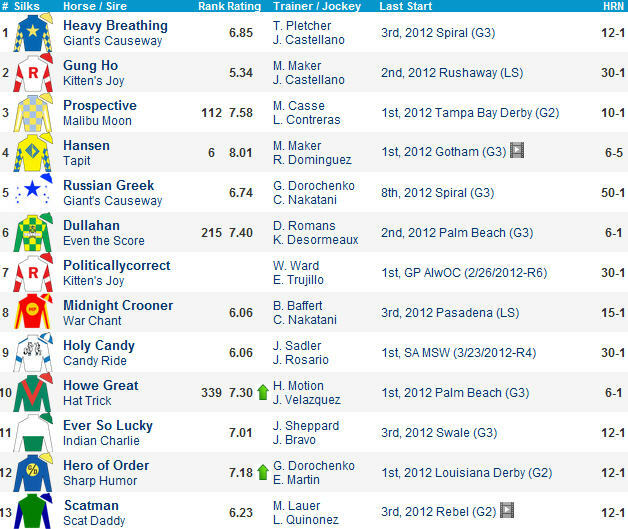 #8 HAMMERS TERROR (6-1) has earned quality Final Time Ratings in all three starts and I like his tactical burst away speed. He is a nose away from a perfect 3-for-3 record. #4 Mr. Bowling (8-1) was making nice progress from a numbers standpoint prior to finishing a flat 3rd as the beaten favorite when last seen in the flat mile G3 Iroquois at Churchill in November. He earned his best Final Time Rating around two turns and could be poised to fire a fresh shot for Larry Jones. 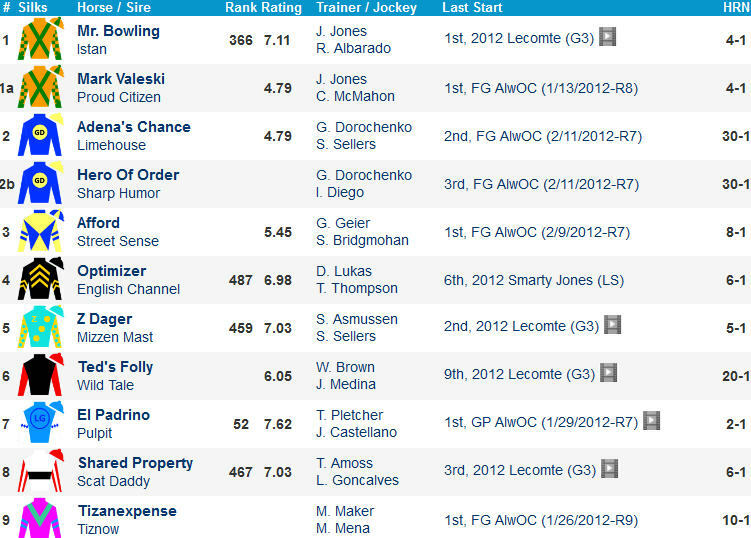 #3 Ted’s Folly (10-1) has rattled off six straight and is a nice success story. He won the Springboard Mile last time and runner-up Reckless Jerry just missed in the Smarty Jones Stakes at Oaklawn on Jan 16 while show finisher Pee H Dee came back to win an allowance race at Oaklawn on the same day. #10 Capetown Devil (6-1) is 3-for-3 and has earned a Stakes shot after working his way from Maiden Claiming to Starter Allowance to Optional Claiming. The improving gelding projects a tactical trip. #11 Shared Property (4-1) flashed ability as a juvenile for Amoss but he is stuck out in post 13 and has not raced in more than three months. #5 Exfactor (5-1) was all out to win by a nose in his dirt sprint return. He stretches out 2nd off the shelf and is a bounce candidate. #6 Seven Lively Sins (9-2) exits a weak renewal of the G3 Delta Jackpot. He did beat Mr. Bowling in the Iroquois and might be best around one turn. The Al Stall Jr. trainee looms a pace factor at the very least. #2 Dan And Shelia (6-1) captured his flat mile bow at Gulfstream for Pletcher. The $150,000 son of More Than Ready tries two turns in his first start against winners and gives up a seasoning edge in this spot. #2b Z Dager (6-1) exits a course/distance maiden win in the slop for Asmussen. This is an ambitious placement for the recent graduate. #1 Adena’s Chance (20-1) and #1a Hero of Order (20-1) both seem up against it, along with #7 Alexander Thegreat (30-1) and #9 Chalybeate Springs (20-1).